Over the past couple of years I’ve been leaning towards going vegetarian. I guess, I could never entirely stop eating meat (or seafood or chicken) but due to health reasons, I have been trying to cut back on animal proteins. 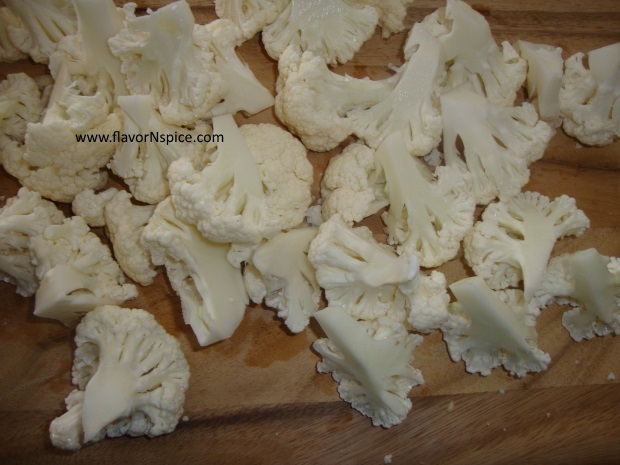 However, it is often hard to feel full after a meal of only vegetables but I there are some hearty vegetables that have more substance to them and cauliflower is certainly one of them. 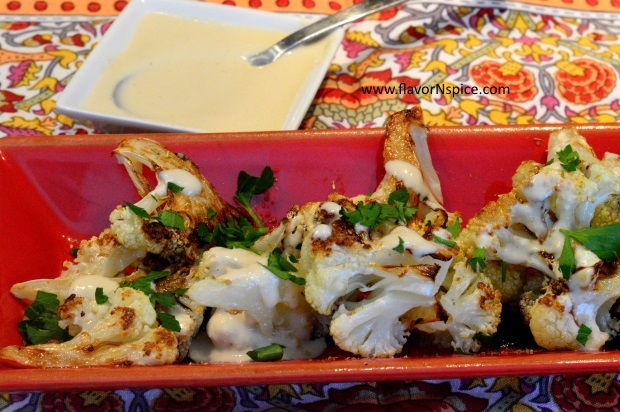 I love the delicate flavor of cauliflower and am always looking for new ways to make it. 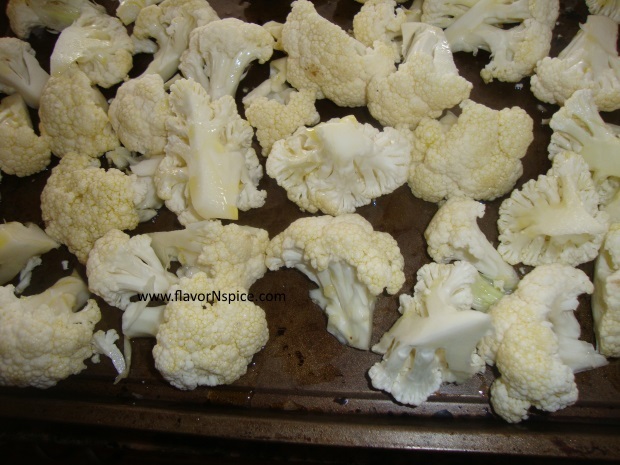 Sometimes I roast the whole cauliflower in an oven, sometimes I make a curried version of it (Indian way of cooking cauliflower) and at other times I roast the florets. Today I roasted the florets and while they were still warm, I drizzled some thick Balsamic and a Tahina sauce over them. It was a quick and delicious warm salad. I served it with a bit of warm pita bread on the side. 6. 1 tablespoon of a thick aged Balsamic (I used a strawberry flavored Balsamic) – make sure that you are using a thickened aged Balsamic and not Balsamic Vinegar. 2. Cut the thick stem out of the head of cauliflower and then cut it in bite sized pieces (separating the florets). 3. 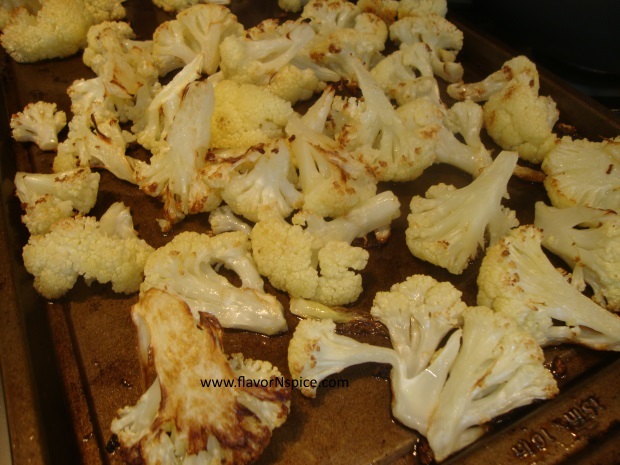 Place the cauliflower over a cookie sheet and drizzle about 1-2 tablespoons of extra virgin olive oil over the florets. Try to coat the florets evenly. 4. Place the cookie sheet in the oven for about 25-30 minutes to roast the cauliflower (time varies a bit depending on whether your oven runs a bit hot or a bit cool). Half –way through the roasting process turn the florets over so that they are roasted evenly on each side. 5. 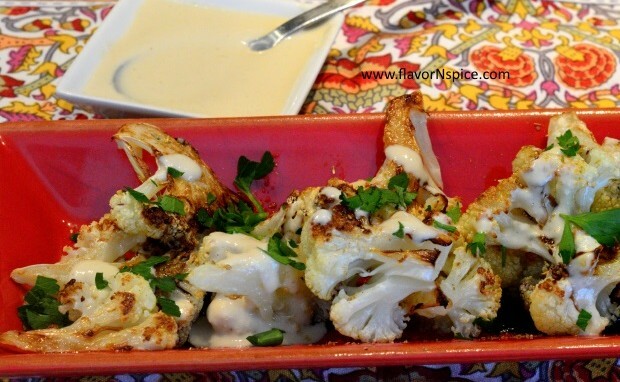 While the cauliflower is roasting, you can make the Tahina sauce. 6. 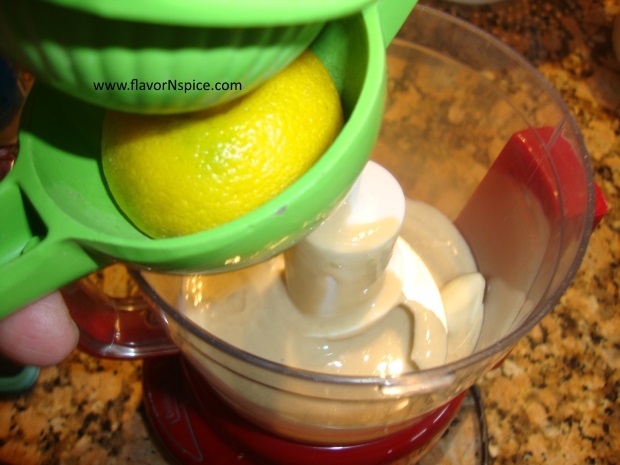 Place one peeled clove of garlic, the juice of half a lemon, 1-2 tablespoons of water, 2 tablespoons of Tahina paste and 1 tablespoon of extra virgin olive oil in a small food processor and grind everything to a paste. 7. Set the Tahina sauce aside. 8. 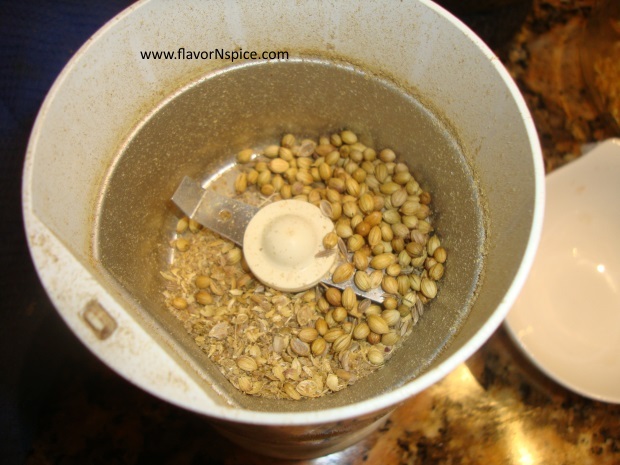 Also grind the coriander and cumin seeds in a spice grinder. Set the ground spices aside. 9. 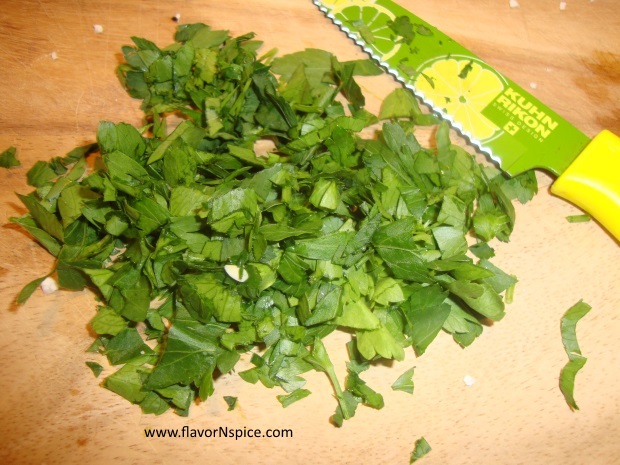 Coarsely chop the parsley leaves to make a garnish. 10. When the cauliflower florets are lightly browned, take them out of the oven. 11. 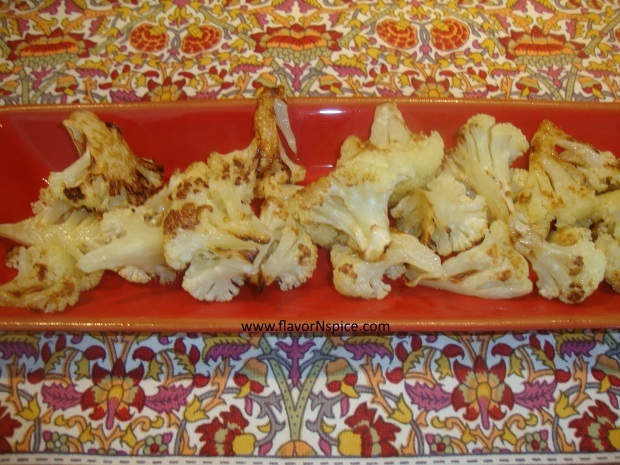 Gently place the roasted cauliflower pieces on a serving dish (they are very delicate so light them gently). 12. Sprinkle the coriander powder over the roasted cauliflower. 13. Also sprinkle the coarse salt. 14. Gently drizzle the thick Balsamic over the cauliflower florets. 15. Also evenly spread the Tahina Sauce over the cauliflower. 16. Sprinkle the chopped parsley leaves over the cauliflower and serve immediately while the cauliflower is still warm. looks delicious! I am now roasting cauliflower on a regular basis – it’s just amazing what high heat and a little drizzle of olive oil does to this vegetable. I roast at 400 F though, and sprinkle julienned ginger over the florets. I’m waiting for summer and the tiny farmer’s markets cauliflowers to make an appearance! 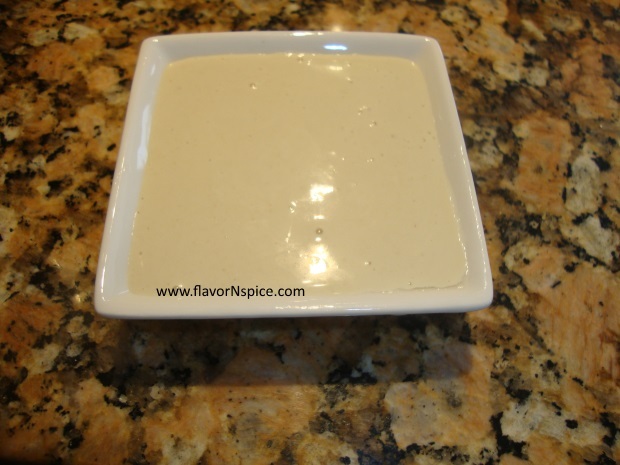 And the other day I made a tahini sauce that blends tahini with yogurt – and a little salt and pepper – it was creamy and luscious. I served it with a marinated chicken shawarma-type dish from the NYT magazine of a few weeks ago. It was really yummy. 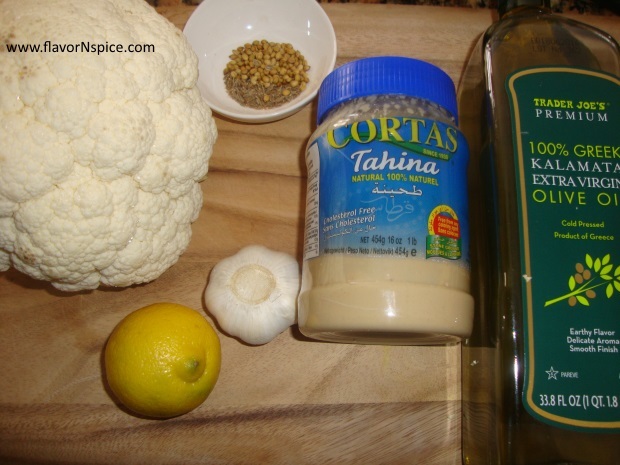 You’ve given me a new idea for tahini – will try it on the cauliflower next time! 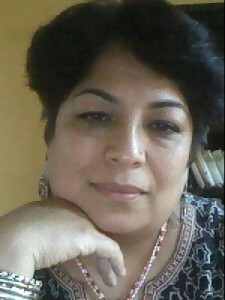 Hi Shilpa! I haven’t tried adding ginger to the roasted cauliflower but it sure does sound good (a bit like the Indian style Tadka). Yes, I too like the farmer’s market cauliflower because they are of a reasonable size and don’t have a high water content (which makes them much better for roasting). Just yesterday I found a Romesco cabbage at Whole Foods and I like roasting those because their water content is a bit lower than the regular white cauliflower. I’ll also try your yogurt-tahini sauce combo. Did you add any lemon juice to it? I love roasted cauliflower. What a good idea to put tahina on it!